The SkillsCommons-Nursing Community is a free, open, user-friendly, online community website for sharing exemplary practices, resources, ideas, and collaborative opportunities developed by U.S. community colleges sponsored by the Trade Assistance Adjustment Community College and Career Training (TAACCCT http://www.doleta.gov/taaccct/ ) program. SkillsCommons (www.skillscommons.org) is the national repository of Open Educational Resources in workforce development produced by the TAACCCT grantees. Members of this community and others developing nursing curriculum in the community colleges are free and welcome to create and participate in discussion forums for sharing ideas, posting documents and links, asking questions, developing collaborations, and much more to support and advance the success of workforce development programs. Members of nursing industries, professional organizations, and workforce development initiatives are welcome to join and participate in the Voices for Nursing Community as well. The community is open to all who want to contribute constructively to enhancing, improving, and innovating healthcare education, training, and workforce development. Started by Rick Lumadue Apr 13, 2018. 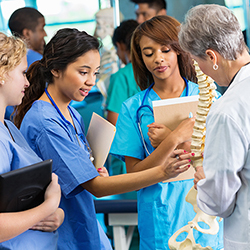 Stacked and Latticed Credential in Nursing: What’s Working For YOU AND YOUR STUDENTS? You need to be a member of Voices for Nursing by SkillsCommons to add comments!